**I won this book in a Goodreads giveaway. 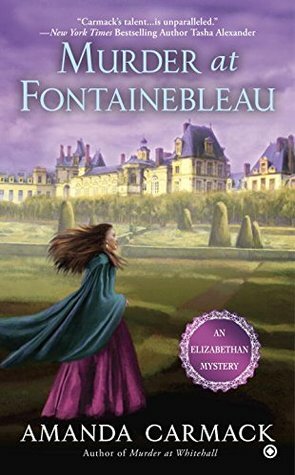 This does not affect the content of this fair, honest review**Murder at Fontainebleau is the 5th book in the Elizabethan Mystery series by Amanda Carmack. I have not read any of the other books in this series. I loved this book -- so I will definitely be reading the rest!The year is 1561, Queen Elizabeth 1 is on the throne of England. But her claim to the throne is challenged by her cousin, Mary Queen of Scots. Mary still resides in France following the death of her husband, but may soon choose to return to Scotland, or remarry. Queen Elizabeth sends a party of trusted members of her court to Fontainebleau to visit the French royal court. Included in the group is Kate Haywood, royal musician. Kate is on a mission for her queen, carrying secret letters and observing the French court to glean information about Mary's intentions. When a member of their group is murdered, Kate must also discover the killer's identity before their mission is discovered or the incident used to discredit Queen Elizabeth. Royalty. Ambition. Courtiers. Deceit. And, murder. It's all in this book. As I read the story, I found myself swept into imaginings of the pomp and mystery of the English and French royal courts, the political intrigue, and the constant jostling for position. Carmack's descriptions of the fashions, entertainment, relationships, dangers and secrets of life at court are vivid and engaging. I was totally engrossed in the story. The mixture of historical fact and fiction was perfect! I love studying history, especially the Elizabethan era. Fashioning a murder mystery around the actual conflict between Elizabeth and her cousin Mary made for a great read! The cover art for this book is amazing! All in all, a great book! The mystery portion of the plot was engaging and well-paced. The history and mystery portions of the story were well-balanced and kept my interest throughout. I was engrossed in the story from beginning to end. As a history buff and mystery lover, this series is perfect for me! I will definitely be reading the rest of this series! Amanda Carmack is a pseudonym used by award-winning romance author, Amanda McCabe. McCabe has published many novels, including Winter Queen and To Tame a Rogue. Learn more about the Elizabethan Mystery series at the author's website: www.amandacarmack.com . I love the Queen Elizabeth I / Kate Haywood mysteries! This was no exception! It's a wonderful book in a wonderful series. Full of intrigue, historical characters and a murder to solve! I highly recommend it! Kate Haywood is a young musician in the 16th Century Court of Queen Elizabeth. A distant relation to the young Queen, she is in service to the Queen in more than just her role as an entertainer. Directed by Elizabeth to look into “secret matters”, Kate finds herself embroiled in intrigue and murder in the French Court at Fontainebleau.I rather like the premise of this bright young woman engaging in the business of the Court abroad. While she has been a member of the English Court for most of her life, she has become a spy, or agent, for the Queen. Her role is tenuous and uncertain and dangerous, of course.This is the fifth entry in Amanda Carmack’s The Elizabethan Mystery series. The story is well researched and steeped in historical content. Elizabeth’s England and reign is wildly interesting, and a terrific venue for a murder mystery. The writing is rich with historical accuracies and fancies and a real delight to read. In this era of Netflix and PBS and our renewed interest in the history of our British friends, this series is a lovely addition. I received this book from the author for an honest review; it is well worth reading, my friends. Now to get my hands on the first four books . . . Predictable and elementary book, but I was on my way to spend a few days in Fountainebleau, and wanted to get a sense of place, so I read the book...as I toured the Chateau and biked the surrounding forests I could feel the history....I love how reading can enhance ones travels. I really enjoy this historical mystery series. Now I have to read the next one to see which of Kate's two suitors she chooses. I think that she will remain single and stay in Queen Elizabeth's court. It was ok. Not a thrilling mystery, but the book doesn't set itself off to be a thrilling mystery in the first place. Just not my type of pace. This is a fascinating novel about the 16th century royal courts of France and England centered abut Elizabeth I, Mary Queen of Scots and Catherine de Medici. Despite the fact that little of substance occurs for the first 150 pages, the author keeps your attention with the thoughtful machinations of the principal Kate, Queen Elizabeth's personal musician and confident. She sends Kate to the French court to serve as her eyes and ears. Surprisingly, the central murder does not occur until more than halfway through the story. The culprit is obscured so to speak, amongst a host of suspects and plans within plans. Although events pick up from there, the story actually continues at a relatively measured pace through to its anticlimactic resolution. While the plot is relatively simplistic, the author's well researched historical context and rich environmental descriptions kept my interest even in the absence of much action. Thus, the writing saves what could have been a relatively slow dull read. Also the main character the wise, introspective and somewhat plucky (pun intended) lute player, Kate is well developed and likeable as are to a lessor extent the sympathetic men around her. If you enjoy historical novels with a little intrigue, you may enjoy this one. There are no objectionable language, violence or adult situations. After her father dies, Kate Haywood feels lost and alone. Until Queen Elizabeth sends her on a mission to France, where Elizabeth's cousin Mary, Queen of Scots, has recently lost her young husband. Kate is not alone, on her mission, but she is not sure exactly whom she can trust, and who might be working for the French or the Scots. When another young Englishwoman is killed she makes it her mission to discover who the culprit is, regardless of any danger to herself.While this series is not entirely believable in some ways, it is enjoyable, and it also provides and interesting and intriguing view of the era in which it occurs. Recommended. The attention to detail and the characters make this an amazing book! If you are a fan of the Elizabethan era then this a must read! Kate is a very talented musician and loyal to the queen. When the queen' s cousin makes a claim for the throne Kate is sent to gather information! While on her mission a member of her group is murdered. Kate must act quick and find the killer before someone uses this information to discredit the queen. I won this book and this is my fair and honest review. I highly recommend this book and I will definitely be reading more from this author! For my full review, go here: http://murderisdelicious.blogspot.com... This was the first book that I've read in this series. I loved this story so much that (literally) as soon as I finished, I went online and ordered all 5 books from my favorite independent history and mystery bookstore, Centuries & Sleuths Bookstore. I can't wait til they arrive so I can read the earlier installments in the series. If you like historical fiction and enjoy a good traditional mystery, definitely check this out. I received this from NetGalley.com as an ARC. I have read the other books from Amanda Carmack and have really enjoyed her Elizabethan mysteries. She has fun stories with twists and great characters. She weaves in this history and historical figures so well to make it seem real. The stories are fun little cozy mysteries that remind me of the series by Karen Harper. I am always looking for a good historical mystery series and this one doesn't fail to deliver. Rather light reading. I found several plot inconsistencies. In one case, she refers to Queen Catherine's preference for seances and later on she refers to details of a seance that appears to have occurred, but no mention ever made of it happening or anyone attending a seance. Several other small plot disconnects also evident. Overall, I did not enjoy this book; preferred books earlier in the series. An interesting mystery, with court politics, spies and a touch of romance. An opening on the world of France with Catherine De Medici and Mary, Queen of Scots as secondary characters. The world of Fontainebleau Palace in its' splendor is glimpsed, as is the treachery of court life. No one is what appears on the surface and death is always lurking. A good read. I love this series and it gets better and better with each new book. Please keep them coming Amanda Carmack! Really enjoy this whole series so far. Very entertaining book. Wish there were more in this series.